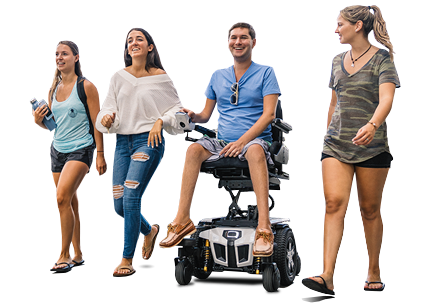 DURYEA, PA – Quantum Rehab® has launched Interactive Assist, a new app which provides a direct real-time connection from a power chair’s electronics to a provider’s programming station. The connection provides the technician with full system and diagnostic information along with tools, such as a real-time mirror image of the power chair’s electronics display, to eliminate wasteful service trips. Interactive Assist works via an app that is available for download in the Apple App Store and Google Play Store. The consumer links his or her controller to the app using a smart device, and a secure connection is made to the provider. From there, the provider or technician can view every aspect of the power chair’s electronics in real time, even as it operates. While connected, the consumer and provider can also communicate via text chat. Quantum Rehab® is a premier global innovator of consumer-inspired complex rehab products, including the Edge 3, 4Front®, and Quantum Series of power bases, iLevel® seat elevation technology, TRU-Balance® 3 Power Positioning Systems, Q-Logic 3 Advanced Drive Controls, and Stealth Products® cushions and positioning components. Please visit quantumrehab.com.